Marlborough Boys’ College along with our sister School Marlborough Girls’ College is located in the heart of the world-famous wine region of Marlborough. Marlborough College was founded in 1900 and is situated in the safe provincial town of Blenheim. The Colleges work closely together to offer a high-quality education. To create for the young men of Marlborough an inspirational learning environment in which high expectations exist in all endeavours. Achievement in NCEA at each year level has been steadily improving during the past six years. The college promotes a culture of care and inclusion for all. Boys have meaningful opportunities to develop the skills, qualities and attributes needed for success in and beyond school. Their level of engagement, learning and achievement is well tracked and supported. Teachers are placing an increased emphasis on ensuring excellent outcomes. School leaders are improvement focused and respond well to change. 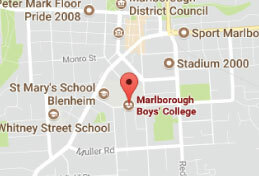 Marlborough Boys’ College provides high quality care and education for its international students. The boys are well integrated into the school and community, for sports activities. They are provided well-planned English lessons designed for speakers of other languages and a range of other meaningful learning experiences. The principal and International staff collaborate well to ensure the international programme is effective. Marlborough Boys’ College A student advisor will be in contact within one working day.